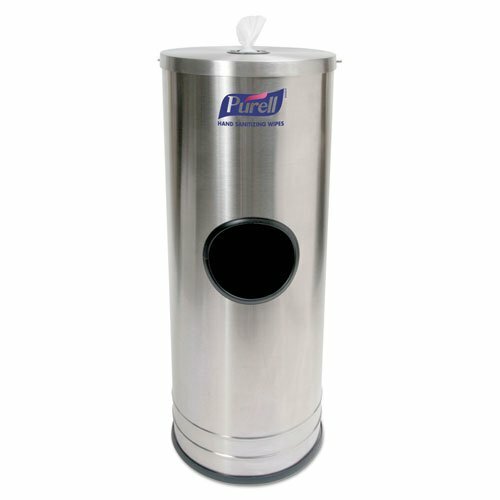 Attractive, freestanding stainless steel stand for dispensing sanitizing wipes. Designed to hold 1,500 count refills of PURELL Hand Sanitizing Wipes (sold separately). Ideal for high-traffic locations, like health and fitness clubs. Stand integrates a 5" diameter trash opening on side of unit for wipes and trash. Includes new patent-pending SIMPUL nozzle with re-wetting design ensuring consistent wipe saturation for effective hand sanitizing and 99.99% germ kill with every wipe. Sturdy double beaded base adds elegance and stability with included weight. A built-in full rubber gasket protects floor surfaces.